Once you arrive at the Delhi airport or railway station, you will get an assisted transfer to your hotel. After some rest, leave for sightseeing. You will cover the attractions of Old and New Delhi. The day’s visit might include Red Fort, Jama Masjid, Chandni Chowk, President’s House, Qutub Minar etc. Stay overnight. After breakfast, get transported to the New Delhi railway station for boarding the train to Chandigarh. Once you arrive in Chandigarh, get an on road transfer to Manali. Manali, located at an altitude of 6726 feet is an extremely popular hill station, amidst the Beas River Valley in Himachal Pradesh. Once you reach Manali, check into the hotel. After journeying for the entire, now it is time for a good night’s sleep. Overnight stay. Entire day 3 is going to be full of activity. After breakfast, you will go for Gulaba, Kothi Gorge, Marhi, Rohtang Pass (Subject to weather) and Solang Valley. Admire the scenic beauty around you. While at Rohtang Pass and Solang Valley, you can enjoy a number of adventure and fun activities like Igloo-making, Paragliding, Trekking, Skiing and more. Back to Manali for an overnight stay. On the 4th day, have your breakfast and leave for covering the attractions of Manali. Visit the popular Hidimba Devi Temple constructed during 1553, Manu Temple, Tibetan Monastery and Vashisht Village. Have your lunch, and get transportation to Kullu by road. On the way, visit the Vaishno Devi Temple. Once you arrive in Kullu, check into a hotel. The evening is free for enjoying fun activities. Explore the local bazaar of from where you can shop for woolens, which are of excellent quality. Admire the amazing surroundings. Stay overnight. Relish an assortment of delicacies in your breakfast and by road get transferred Shimla. The capital of Himachal Pradesh is one of the most popular hill stations of India. The buildings of this hill town have kept intact the colonial feel. Once you reach Shimla, check into the hotel. Spend rest of the day in doing activities of your interest. Take a leisure walk admiring the natural beauty that is spread around you. In the evening, you can shop at the Mall road or can take a leisure walk on the Ridge road. Stay overnight. Day 6 after breakfast is fixed for an entire day’s excursion to Naldehra, Kufri and Chail. Kufri is an extremely popular destination for adventure activities such as skiing and tobogganing. These places are extremely beautiful and are a treat for one’s eyes. Try your hand at hiking, once in Chail. Back to Shimla for an overnight stay. 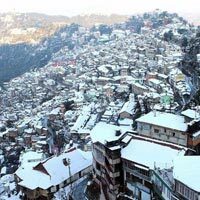 After breakfast, half-day is fixed for sightseeing in Shimla where you are going to cover attractions like Sankat Mochan Temple, Indian Institute of Advanced Studies and Jakhu Temple, an ancient temple, dedicated to Lord Hanuman. After lunch, begin your road journey for Chandigarh. Once you arrive, check-in at the hotel. If time and energy permits, you can shop at the popular markets of Chandigarh. Stay Overnight. Have your breakfast and leave for a half - day tour of Chandigarh. You are going to cover the well-known Rock Garden, a beautiful sculpture garden, also known as Nek Chand’s Rock Garden. Afterwards, you are going to visit the beautiful Sukhna Lake, a popular tourist attraction in Chandigarh. Try boat riding on this amazing artificial lake. Return back to Delhi by road. Get down at the airport or the railway station for your onward destination journey.